Let there be light! Since prehistoric man discovered how to capture and contain fire, lanterns have been the “go to” method of illuminating the dark of night. 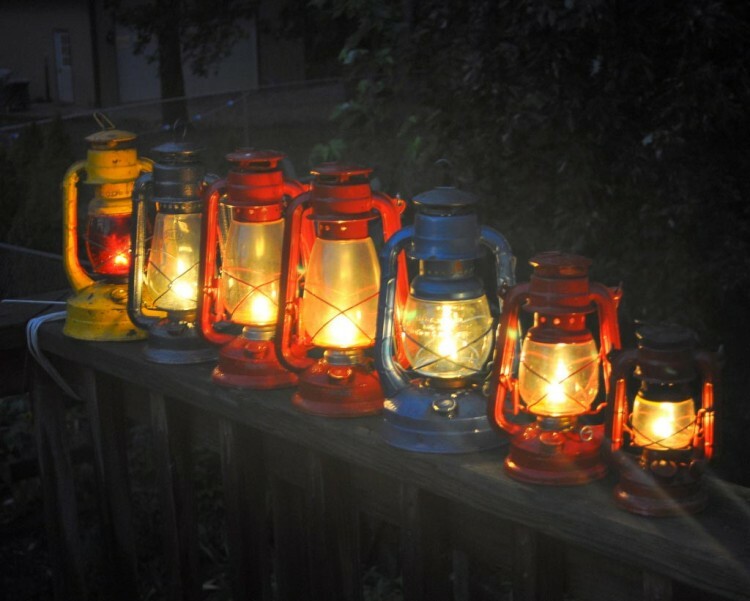 Lanterns are particularly popular when camping or entertaining friends outside. The light they emit is enough to see by, and the ambience they provide is priceless. In fact, some would argue, you can never have too many. 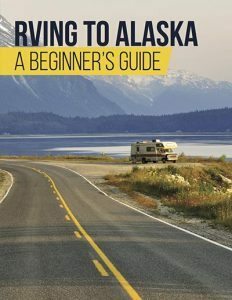 For that reason, it is beneficial to have an inexpensive and easy method to make your own. 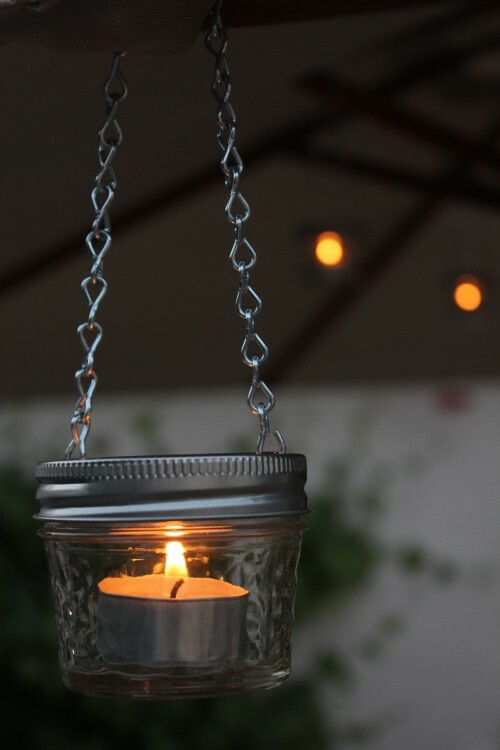 Something, perhaps, like this simple Mini Mason Jar Lantern Project. This project comes to us courtesy of the DIY craft site, Jennifer’s Mentionables. Jennifer was inspired to construct her own glass lanterns from mini masons jars when she saw these cute lamps from Pottery Barn. 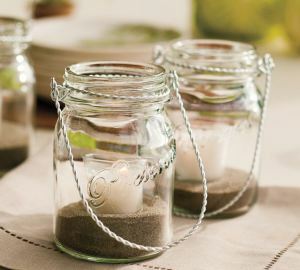 Many people have Mason jars lying around their homes, whether in basements or pantries for canning, or leftover from the preserved goods of someone else’s efforts. Jennifer had some jars left over from a previous craft that she was able to repurpose. 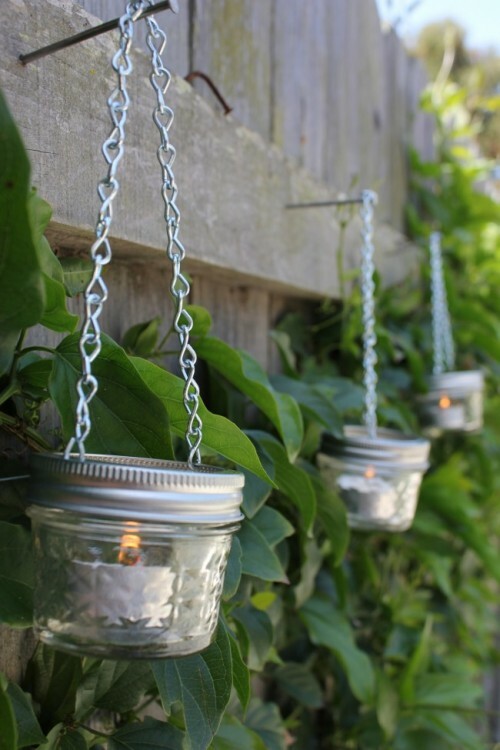 Determine whether you want to use chain or wire for hanging the lantern. Decided how far down you want the lantern to hang down. 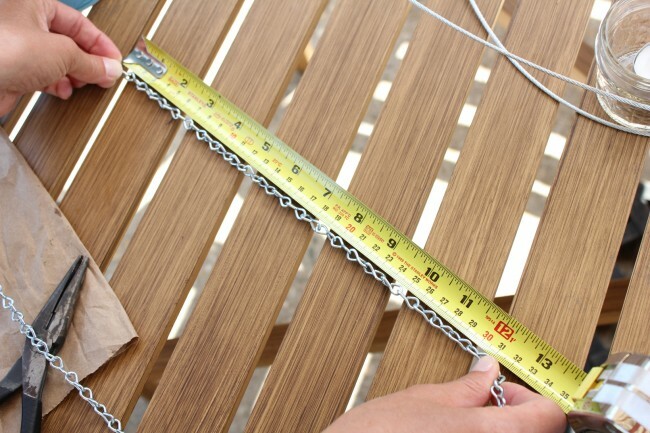 Use a measuring tape and mark on the chain or wire where it needs to be cut. This is especially important if you are planning to make a matching set to ensure that they hang at the same level. 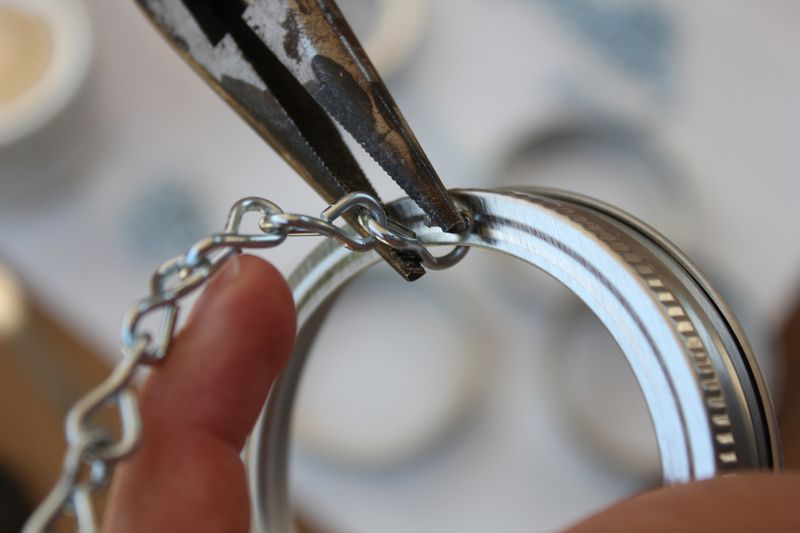 If you are using wire, simply snip it to the length you want with wire cutters. 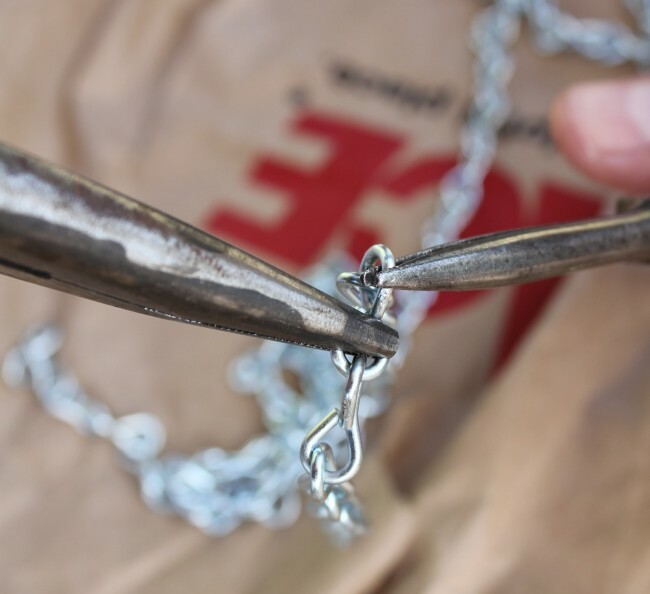 If you are using chain, use wire cutters, a file, or a butter knife to open the link. You don’t have to open it very far, just enough to separate the links to obtain the desired length from the total chain. 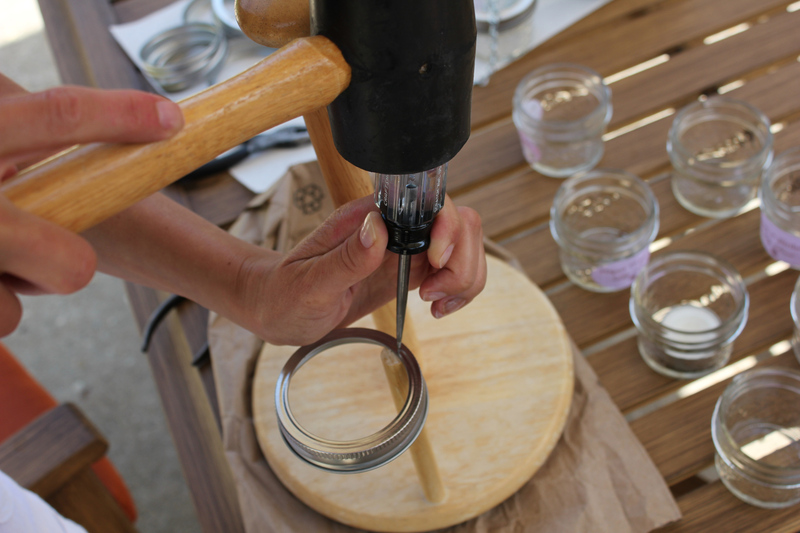 Remove the metal ring from the jar lid and place it on a piece of wood to stabilize. 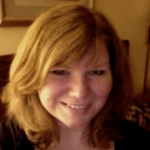 Jennifer uses a paper towel dowel. With the rubber mallet and metal awl gently punch two holes in the ring, one directly across from the other. Thread the link through the hole and pinch it closed with a pair of pliers. Screw on the lid. Insert a votive candle and you are done. This charming creation is also versatile. By substituting dried flowers or marbles, it becomes a static decoration. With a bit of dirt and some seeds, it can quickly become a no fuss planter. As you can see, by following this easy process you can produce an attractive lantern that is even more impressive at night. 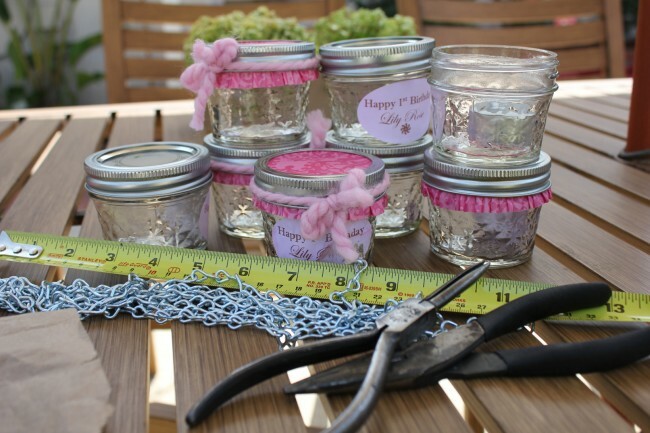 Not only is it a simple craft, if you have empty jars lying around, it is nearly free. If you found this clever creation inspiring, please share with your friends and any family members who enjoy a good craft project. If you’re lucky, maybe they’ll make you one too.